Winnipeg businessman Mike Vogiatzakis will take a second crack at officially entering the mayoral race on Friday, after he was unable to prove he was a resident of the city as required by the Elections Act. Winnipeg businessman Mike Vogiatzakis will take a second crack at officially entering the mayoral race on Friday, after he was unable to prove on Thursday that he was a resident of the city as required by the Elections Act. Vogiatzakis calls it "a little glitch" and said although he lives in St. Andrews, he owns property on Henderson Highway that will qualify him as an eligible candidate. He told CBC News he is just getting the paperwork from his lawyer and will return to the city clerk's office. Thursday marked the first official day that candidates for mayor can register and start campaigning in advance of the Oct. 22 election. Vogiatzakis, a funeral director, spoke with reporters outside city hall on Thursday, saying he wants to clear up reports in the press about his background. With the exception of some civil matters, Vogiatzakis said he's been trouble-free in recent years. 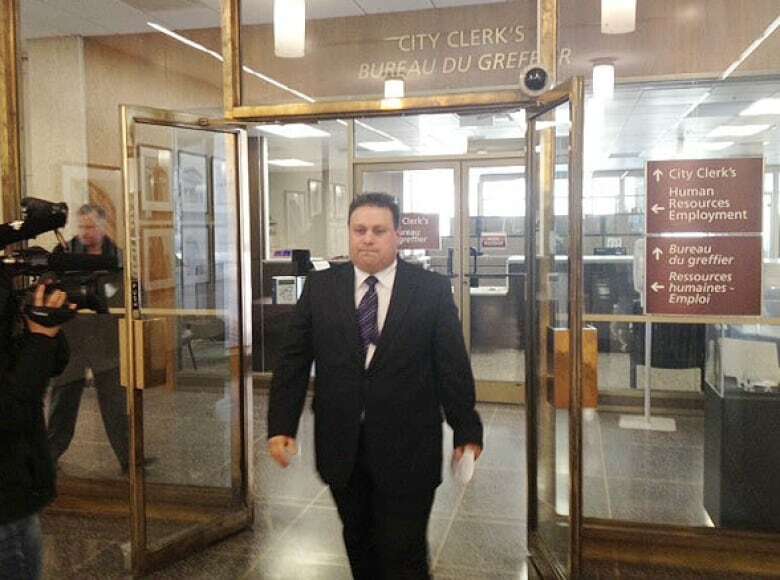 Mike Vogiatzkis comes out of the city clerk’s office at Winnipeg City Hall on Thursday, after handing in his paperwork to declare his candidacy for mayor. (Sean Kavanagh/CBC)"I've changed over the past 15, 20 years, and I am a different person," he said. "I deal with people every day. I deal with them with compassion, I deal with them with honesty, and I deal with them with the utmost respect." Vogiatzakis gave reporters copies of a Winnipeg Police Service criminal background check he had obtained on himself. It shows two convictions: one for contempt of court in 1987 and another for assault in 1988. "I'm here today to set the record straight. I'm providing each and every one of you with a copy of my criminal record so you can actually report what I do have as a criminal record," he said. Vogiatzakis said the assault charge was related to an incident when he was a hockey coach. He said he intervened when an elderly man was being harassed by a player. As for the contempt of court charge, Vogiatzakis said he cannot recall where that charge came from, but said it might be because he had missed a court date. After addressing his background, Vogiatzakis told reporters the biggest issue facing the city is infrastructure. "It's potholes, it's the streets, it's infrastructure. It's terrible," he said. In March, Vogiatzakis showed reporters a possible pothole solution: a machine that mixes asphalt pothole filler with recycled tires at hot temperatures. "I brought a solution for potholes … maybe not a permanent solution, but it would fix the potholes," he said Thursday. Vogiatzakis, who said he is not affiliated with any political party, added that the city needs new leadership. "The weather right now is almost like Sam Katz — it needs to be changed," he said. "We need warmer weather. We need a breath of fresh air pumped into the city, right across the city. We need change everywhere. Sam Katz has done it … and he really hasn't done it." Local blogger Gordon Warren has announced his candidacy for mayor and approached the city clerk's office to file his nomination. Former city councillor Gord Steeves, who launched his public campaign for mayor in October, will submit his papers on Friday morning. Both Steeves and Vogiatzakis received warnings from civic election officials last month for launching their campaigns before Thursday's official start date. It remains to be seen if or when several other Winnipeggers, who have expressed interest in being mayor, will make it official. FEATURE: Who should be Winnipeg's next mayor? Current councillors Scott Fielding and Paula Havixbeck have said they're seriously thinking of running for mayor but haven't announced their intentions either way. Former NDP MP Judy Wasylicia-Leis, who unsuccessfully ran against Katz in the 2010 civic election, also has yet to declare if she will run again. Local lawyer Brian Bowman is also close to a decision. As for the incumbent, Katz has said he will announce in June if he plans to seek re-election or not. "Election 2014 is shaping up to be a pivotal one," said Loren Remillard, vice-president of policy and public affairs at the Winnipeg Chamber of Commerce. Remillard said while beat-up roads and frozen pipes are important, the chamber of commerce is looking for contenders with ideas about where Winnipeg is going in the future. He said it's also looking for candidates who will restore public confidence in city hall. "The fact that we are having issues around openness, transparency, ethics does gives us cause for concern," he said. City hall was rocked by high-profile controversies in recent years, including a fire hall land swap that was the subject of a scathing audit and cost overruns related to the construction of the new police headquarters. The registration and campaign period for candidates for councillor begins on June 30.